Come visit our eye health facility that is dedicated to providing you with the best in eye care and customer service. 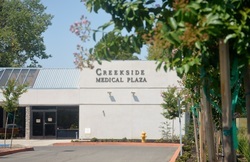 Creekside Eye Center is a full-service eye care facility dedicated to your vision and eye health located in the Creekside Medical Plaza in Lakeport, California. Our eye doctor, Dr. Alan D. Sampson, provides comprehensive eye exams, evaluation for eyeglasses or contact lenses, small-incision cataract removal, treatment of glaucoma and eye disorders, and other eye care needs. Dr. Sampson is a leading ophthalmologist with over 27 years experience in eye care and eye surgery. Our eye care facility carries the latest and most advanced equipment to help Dr. Sampson properly diagnose and treat your eye conditions. Directly across from Dr. Sampson's office, The Optical Shop at Creekside Medical Plaza carries the latest in designer glasses and sunglasses, allowing you to complete your trip for new prescription or non-prescription glasses in one convenient stop. At Creekside Eye Center, our expert staff will ensure that you receive excellence in medical care, quality customer service, and a pleasant visit.